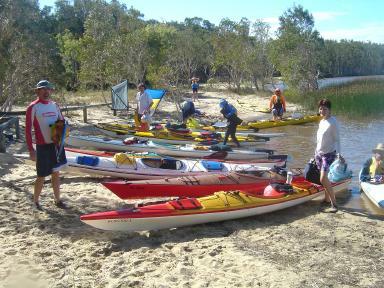 There were a few late minute cancellations but a good size group assembled at the canoe launching area just south of Elanda Point. 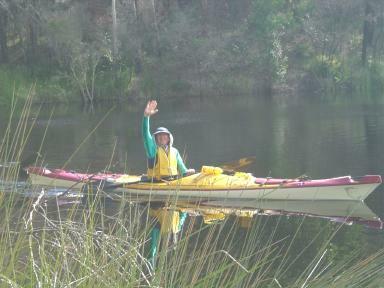 Mark and Sue had driven to Harry's Hut, paddled to campsite 3 set up camp and returned for the evening paddle. Most had simply been grateful to get away from work in time to make the launch. 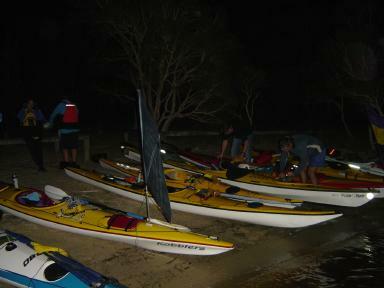 The rush was too much for some, who admitted to arriving without essential wine supplies, so Steve obliged with a wine run into Boreen Point. The moon was full but had difficulty breaking through the cloud cover. While there were some gaps, the cloud was building and rain threatened for most of the evening paddle. 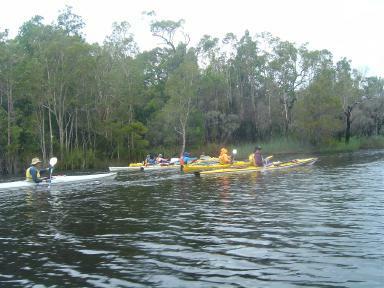 The crossing to Kinaba information centre was uneventful with the assistance of a freshening SE breeze. 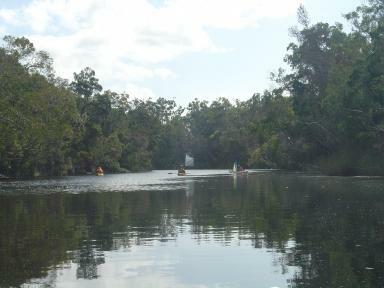 After a brief stop, we continued into the Everglades and onto the Noosa River. 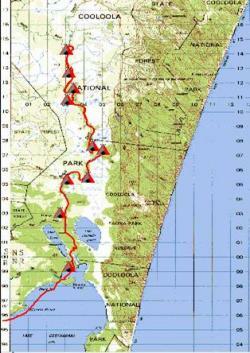 Everyone was able to safely negotiate Malloch's Folly (colloquially known as Anthony's Log) and arrived at campsite 3 (16.3 Km from the canoe launching area). 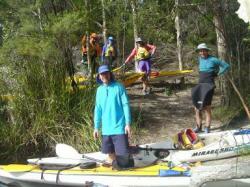 There we caught up with Malcolm and friend who had also set up camp earlier. 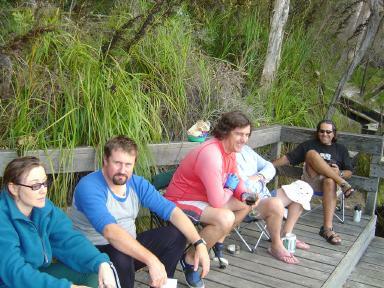 We made camp, and the rain eventually hit as we were having supper (fruit cake) and a few wines - ports at about 1:30 AM. On Saturday morning some folks elected to walk to the Cooloola Sandpatch in the freshening breeze. 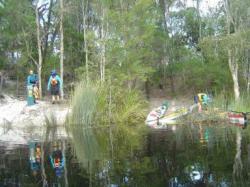 A party of seven paddlers elected to head for campsite 15 and Mark and Sue reconnoitered the campsites on the way back. While the wind was following on several sections of the river, sailing was not effective because it was too fluky. The head wind on the return journey was easily avoided by hugging the banks. The impact from recent fires was obvious but the vegetation was reestablishing itself. 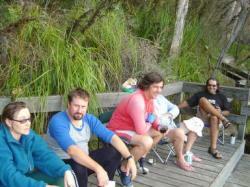 A couple more paddlers joined the trip on Saturday and sundowners were taken on the deck. 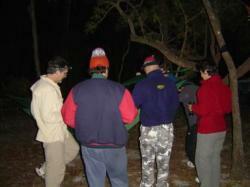 Malcolm and friend were late getting backfrom their walk and Nev led the debate about an appropriate search strategy. When they arrived back exhausted, they had enough energy to light the lantern to make dinner preparation easier for the rest of us, then retired. The two Daves presented their 'mood' and 'practical' candle holder designs while Anthony provided cooking classes on gourmet kayak camping recipes. After dinner we settled in for a few wines, but Dave retired early. He was soon snoring with such gusto that a few tent relocations followed. Patrick held a class on his sleeping hammock that was extremely popular, particularly the 'how to get into it' practical session. 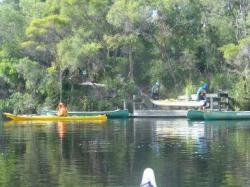 At Sunday breakfast Dave's cooker sounded like a motor boat and we all thought the park rangers were coming up the river. Patrick was most relived when the source of the sound was identified. 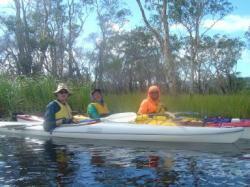 A ten minute shower of rain during breakfast meant we packed up wet gear but we were on the way home by 9:00 AM. Mitch's straps made moving the loaded kayaks easy work. There were a number of groups in kayaks and canoes heading upstream as we returned. A small party of bush bashers diverted from the main channel at the entrance to Lake Como and took the intimate route to the east. 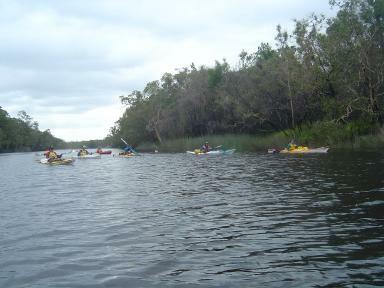 Some of the turns through the reeds were a little challenging for sea kayaks, but it was an enjoyable diversion never the less. 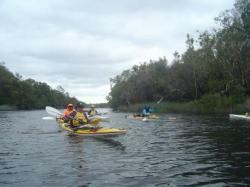 We met some of Anthony's friends at the Kinaba information centre and returned to the canoe landing area with them. There were brief periods of light rain on the river on the way back but the lake presented no challenge and the sun was out when we landed. 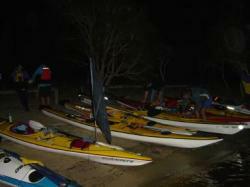 Another great weekend and yet another wet Noosa River moonlight paddle. Wonder who will organize one when it does not rain?